On arrival at Bangalore airport you will be welcomed by our representative & transferred to the hotel. On arrival check-in & day free for own activities. Overnight stay at Bangalore. Morning after breakfast drive to Coorg covering a distance of 250 kms approx 5 hours. On arrival in Coorg you will be welcomed by your hosts. After lunch free time for relaxation. Dinner & Overnight stay at the Guest House. Spend the next 5 days fishing At the 10 kilometres stretch of river Cauvery with your driver and a experienced local fishing guide. It is advisable to enjoying fishing 4 hours in the morning session and 4 hours in the afternoon session as the mid days are not that much worthy to catch the Mahseer. Morning at leisure, after breakfast, around 11:00 Hrs drive to Bheemeshwari, covering a distance of 150 kms approx 03 hrs drive. On arrival check-in at the fishing camp. Evening at leisure. Overnight stay at the fishing camp. Day 09 & 10 full day fishing at River Cauvery with your experienced local fishing guide. Bheemeshwari is on the banks of the mighty Cauvery River. People come here for angling & as well as for bird watching and other wildlife. 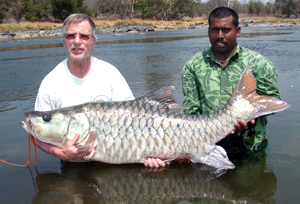 Anglers come here to fight with the mighty Mahseer fish. The region follows a "Catch and Release" policy. Many wild animals including elephants, wild boar, marsh crocodiles, fresh water turtles etc can be spot here at Basavanabetta which is a trekking spot near to this location. Morning after breakfast pack your baggage & transfer back to Bangalore international Airport (100 kms / 02 hrs drive) to board the flight for your home country.